In 2006, satirist Mike Judge told of an impossible future in which our collective intelligence had dropped so low it threatened to destroy the world. Over the past year, however, thousands have questioned in social media whether Idiocracy was actually a documentary. In ten short years, the hilarious but sadly prescient film has transcended its cult classic status to become a vibrant and essential facet of this election conversation. To commemorate the film’s 10th Anniversary, and just in time for last night’s 2nd presidential debate, Mondo has released this killer retro propaganda style Idicoracy movie poster screen print by OBEY Giant’s Shepard Fairey! This is Fairey’s first time to work with Mondo and he knocked this print out of the freaking park. What’s even better, 100% of the proceeds from the sale of this movie poster will be donated to the League of Women Voters and Young Literati. 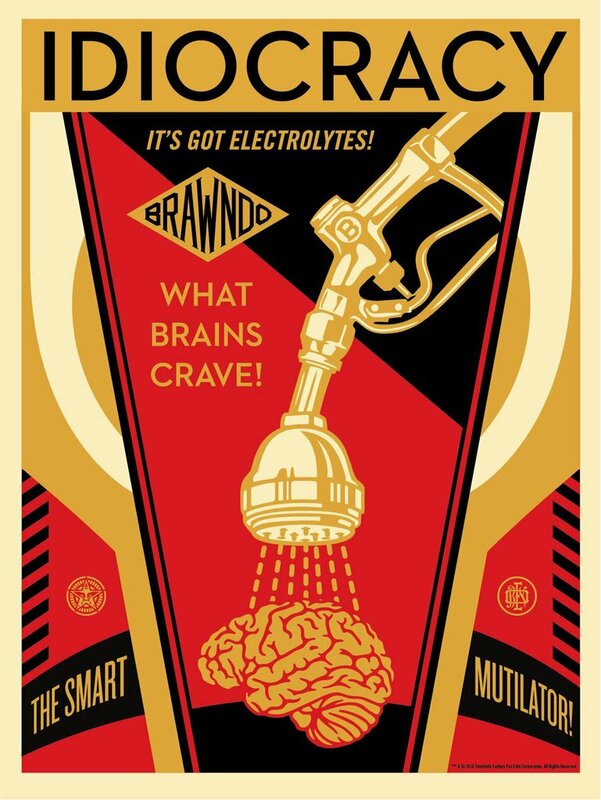 Idiocracy by Shepard Fairey is a 25”x18” signed and numbered screen print. It will be a timed edition and is available for pre-order from now through 7pm CST on Wednesday, October 12th, at the Mondo online store for just $40.